Here is a picture of Oy! fast asleep. It's 8:15P when I took this photo, and he's a growing lizard so he needs his sleep. The best part is, I don't have to tell him that it's bed time. 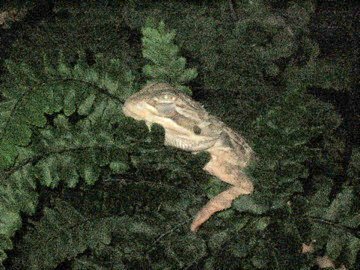 Although, considering lizards can sometimes see with their eyelids closed, one has to wonder whether he really is asleep. Again, he cuddles up against the growing fern. Honestly, I had resorted to growing the fern in the tank because it wasn't doing too well in the open air. This particular fern loves humidity. 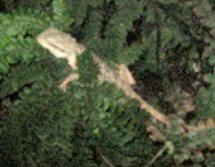 Then I got the lizard. This particular breed loves vegetation and I expect that he will devour my precious fern when he continues to grow. Let's cross our fingers because I have visions of walking my fully grown lizard to the corner restaurant and having dinner while he's parked under the table. I have to confess that I've considered saving the fern and re-potting it now that it's become full again. Of course, I would replace it with a some cactus variation that doesn't have thorns. Even now, I worry about Oy! that he might slip and fall up against one of the twigs of fern that I may have pruned and become impaled. I hope that doesn't occur. What a horrible way it would be to lose a friend. Then again, I have to wonder about my genuosity as my foresight of walking Oy! the two block distance to the restaurant on Sunset Blvd. might be a bit vogue. For starters, I don't even know if they'll allow it, though they allow dogs. Lizards have a tendency to gross people out with the bubonic plague factor (or whatever). If I think I'm zombie-like now, when I treat myself to a pizza and beer, what will I be like when Oy! tags along? ever conscious of how much I touch him and when I wash my hands to eradicate any possibility of salmonella poisoning. And if Masa restaurant denies my pet lizard to accompany me for dinner, what then? Will I neglect him for not meeting his end of the fantasy? I mean, the whole point of caring for him, feeding him, loving him, is too take him out for walks and stand out from the regular dog walker. That's my biggest concern. Don't get me wrong, if the restaurant has its rules, so be it. My main concern is how I will take this and how it might effect Oy! That is something that is yet to transpire for some time. I will take things one day at a time, for now. Oy! seems to be the kick–start of my heart. HE probably considers that he's adopted YOU !